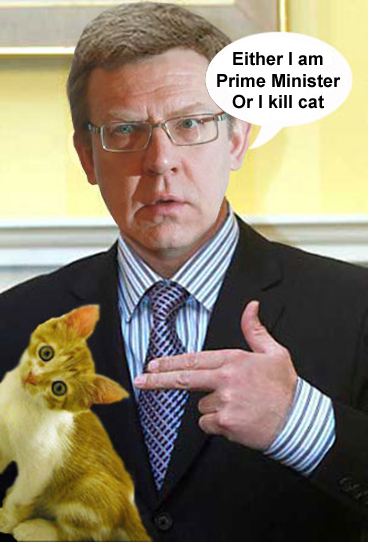 In retrospect, Alexei Kudrin, deputy prime minister and minister of finance, has turned out to be less stupid than Mikhail Prokhorov, when offered President Dmitry Medvedev’s poisoned chalice. On the other hand, by declaring yesterday the race for prime minister is now wide open to all-comers, Kudrin invites a chancy political replay, in which the only certain votes Kudrin can count on are in the Anglo-American financial media, and in Washington, where Kudrin has just issued his bid for Vladimir Putin’s endorsement. In Russian politics, that makes a chalice even more poisoned than the one Kudrin refused and Prokhorov swallowed in June. What Medvedev meant by “conservative” is that not in his 14 years at the Russian treasury has Kudrin found fault with any fiscal or monetary policy except for Keynesian counter-cyclical stimulus. He has avoided public blame for his part in the financial crises of 1998 (he was first deputy finance minister that time) and 2008 (deputy prime minister and finance minister), but he has accepted credit for the recovery. He has been a friend to over-leveraging by the oligarchs and to off-balance sheet default bailouts; an enemy to transparency and accountability on the part of those who run the largest business in Russia — the state budget. Kudrin has never dared to be precise in saying, publicly or privately, what “disagreements” he has with President or Prime Minister Putin. On much humbler matters of diamond policy, for example — for which Kudrin has been the responsible official as chairman of the state diamond miner Alrosa — Kudrin has had the reputation of always taking direction from others, including a string of presidents of the Sakha region, and avoiding disagreements with those who were, nominally, his subordinates. His slowness to act and nervosity in ratiocination are famous. Can this then be the man proposing himself for the prime minister’s portfolio six months before the democratic and constitutional niceties allow it to be awarded? It’s uncharacteristically premature of the conservative treasurer of the state to be announcing a job handout now – unless he had already reason to believe that Medvedev had shot both his presidential and prime ministerial bolts. Asked to clarify what Kudrin meant by “disagreements” in his Washington remarks, the Finance Ministry responded by citing these remarks of Kudrin’s on the ministry website: “I have several disagreements with Medvedev on economic policy, they primarily relate to significant military spendings, “- said Deputy Prime Minister. Kudrin noted that decisions on defense contracts to equip the army, payments, pensions, military equipment and the industrial defense complex with new technologies in 2012 increases budget spending by about 1.3% of GDP, with the increase in these costs over the next years, in 2014 compared with 2011 year there will be an increase of 3% of GDP or 2.1 trillion rubles. “This is the volume of funding of the entire educational system in 2011, including all schools, all secondary schools, all special schools. That is over three years we spend on the army an additional amount equal to the volume of financing of education” – he explained. “I’m sorry that these issues are not discussed at the congress of the United Russia, questions about such serious resources that are spent on military purposes, which is a turning point in the fiscal policy of the country,” – complained the minister. “This is a very significant increase, and in these circumstances, I think it creates additional risks for the budget, as well as for macroeconomics. It does not allow us to reduce the deficit when oil prices are high, it keeps our dependence on high oil prices,” – he said. According to Deputy Prime Minister, before the crisis the budget was balanced at the oil price of $ 90 per barrel, about $ 109 per barrel in 2011, and about $ 112 in 2012. “And this dependence remains, which is risky for our economy. We discussed these issues, but, however, [different] decisions were made. And they are now built into a three-year budget. This reduces the opportunities for financing of other sectors”, – said Alexei Kudrin. “The same is true regarding social spendings, here we also have additional costs, another 0.5% of GDP for the Pension Fund. In this regard, the following year the Pension Fund deficit will reach over 1 trillion rubles, and approximately 25% of the cost of the pension retirement system,” – noted the Minister. In his view, this means that “the pension reform launched in 2008 is not over yet and cannot be considered a success, because one of the most important characteristics or qualities of a successful pension system is a long-term balance in order to support sustainable pensions. I do not quite agree with the proposed solutions”, – added the vice-premier. In retrospect, it now appears that in June Medvedev saw Kudrin as a rival for political promotion, and tried to steer him into the Right Cause trap. Medvedev and his advisors had earlier detected a similar risk with Dmitry Kozak, currently the deputy prime minister responsible for community and regional development, as well as the Sochi Olympic Games. Which others may stand between Medvedev and confirmation as Putin’s choice as prime minister we are likely to find out, now that Kudrin has thrown down his gauntlet. Kudrin was behind a campaign of hints that he was ready to be drafted by Putin as prime minister, which appeared in Reuters, Vedomosti, and Wall Street Journal, during July. The slogan of that campaign was – Kudrin is the banker’s best friend. The hints were also framed in such a way as to place Kudrin’s hat in the ring ahead of men he considered rivals for Putin’s pick — Deputy Prime Minister Igor Shuvalov and Sberbank head German Gref. Those Medvedev advisors with nothing to lose now – Igor Yurgens, formerly in charge of Soviet supervision of international youth movements; Arkady Dvorkovich, Medvedev’s economic advisor; and Gleb Pavlovsky, the PR agent – are bound to pinpoint the rivals they believe are running against their man. They will use the same precision with which they attacked Putin himself in the runup to Medvedev’s demotion. “If the party wins the election, which I’m convinced it will, if we continue to work as well as we have in the past, then I am ready to continue to make a real contribution to modernising our economy, raising the living standards of our people, and creating a modern lawful state. Today I think it is right to pay attention to the practical measures necessary to modernise our lives. A dramatically overhauled Russian Government formed by the winning party, which I am sure will be United Russia, should work at this. Since Putin has to date ignored all pitches for “a real contribution to modernizing our economy”, he’s likely to keep his counsel on what contribution will be assigned to what man until after the results of the presidential election are finalized next March. At least, that’s the hope the state treasurer has decided not to keep his little secret any longer.